Summary: In Siedentopf Law’s latest blog, we look at five ways to avoid family fights over your estate plan: 1) selecting the right executor, 2) explaining unequal inheritances, 3) addressing personal property, 4) including a No Contest clause, and 5) keeping your documents up to date. A person’s estate plan is designed to provide peace of mind to loved ones during a time of stress and grief. It is a means of protecting your assets and providing for your family. However, even the most well-intentioned person can create rifts among family members, if his or her estate plan is not carefully drafted. 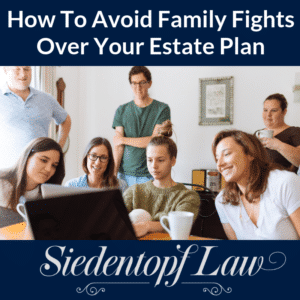 In Siedentopf Law’s latest blog, we look at five ways to avoid family fights over your estate plan. Selecting the Right Executor for Your Estate. Many people select their executor based on personal relationships or family connections. While this is an important aspect of the selection process, you also want to make sure that your executor has the skillset required for the job. Executors do not need to have any special certifications or training, but they do need to possess certain personality traits. An executor is supposed to act “in good faith” and avoid any conflicts of interest, and in order to do that, he or she should be honest, careful, patient, organized, and a good communicator. They need to be comfortable handling disagreements, tempering emotions, and dealing with family dynamics. For more information about selecting an executor, visit our blog “Should I Accept the Role of Executor?”. Explaining Any Unequal Inheritances. If you are not planning on leaving each family member the same amount of assets or property, you should let them know beforehand – and save everyone the uncomfortable or upsetting surprises. Leaving different family members different amounts of money is not uncommon in estate planning. For example, a parent might want to leave more money to their child with the lowest income, or a family member might want to leave the majority of a business to the person who helps them operate it. Whatever the reason, you can avoid family discord by explaining your wishes and reasoning in a family meeting beforehand, and then memorializing that discussion in your will or other estate planning document. Addressing Personal Property or Household Items. When it comes to a person’s estate, their jewelry, artwork, books, or even children’s toys can hold the most sentimental or emotional value. Therefore, in order to avoid family fights over household items, it is a good idea to address these objects individually and specifically in your estate planning documents. A person speaks with their family members and loved ones, and makes a list of what each person wants. They can then address the distribution of these items in a Letter of Instruction – which is an informal (not legally binding) document that can be used by the executor and heirs to identify which personal items go to whom, and why. A Letter of Instruction can streamline the distribution process, avoid hurt or surprised feelings, as well as help heirs avoid the stress or guilt associated with cleaning out a relative’s home. Including an In Terrorem (AKA No Contest) Clause. An In Terrorem Clause is a provision in a person’s will designed to dissuade beneficiaries from legally challenging the will. The idea is, if a beneficiary takes legal action and tries to challenge or void the will, he or she will be disinherited and no longer have any rights to the assets left to them in the will. While some may consider this more of an extreme measure in avoiding family squabbles – this estate planning tool can be very valuable, especially if the testator (the person writing the will) strongly suspects that there will legal challenges to his or her estate plans. Keeping Your Estate Planning Documents Up To Date. Once you have your estate documents drafted, it is a good idea to revisit them every couple of years, and especially following a major life event such as a marriage, birth, divorce, or death in the family. You want to make sure your documents reflect your current family status and your current wishes for the distribution of your assets and other property. Staying up-to-date on estate planning can also provide peace of mind to your loved ones that you are taking an active and interested role in your estate and your family. If you have any additional questions about estate planning or preparing documents so as to avoid family conflicts, you can contact Atlanta, Georgia estate planning and probate law firm Siedentopf Law at (404) 736-6066 or schedule an appointment with us online. ← Video: What is a will caveat?